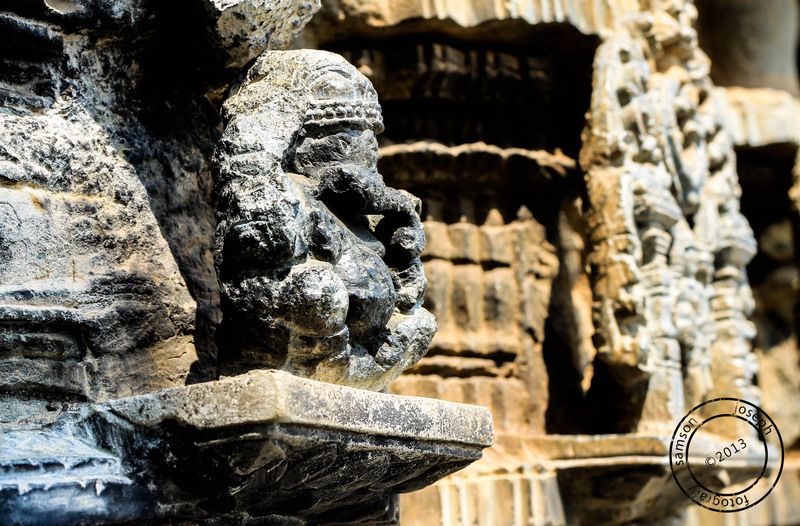 A sculptors dream lived in stone, would be the least few words to describe the temples at Belur & Halebeedu of Hassan district in Karnataka. If the great writers weaved poetic marvels on paper with pen then this would be how a sculptor would create wonders on stone with his skills. 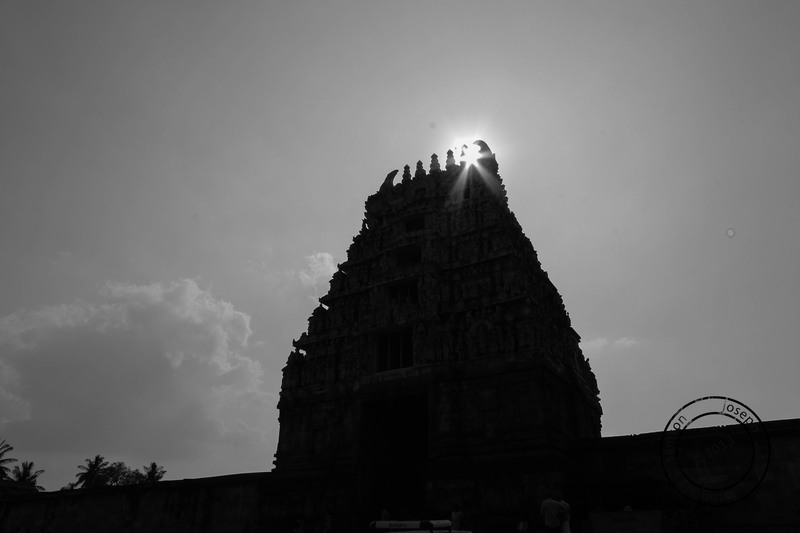 If Hampi is considered to be the school of stone art and Badami-Aihole-Pattadakal to be the colleges then Belur-Halebeedu are the universities of this amazing form of art. 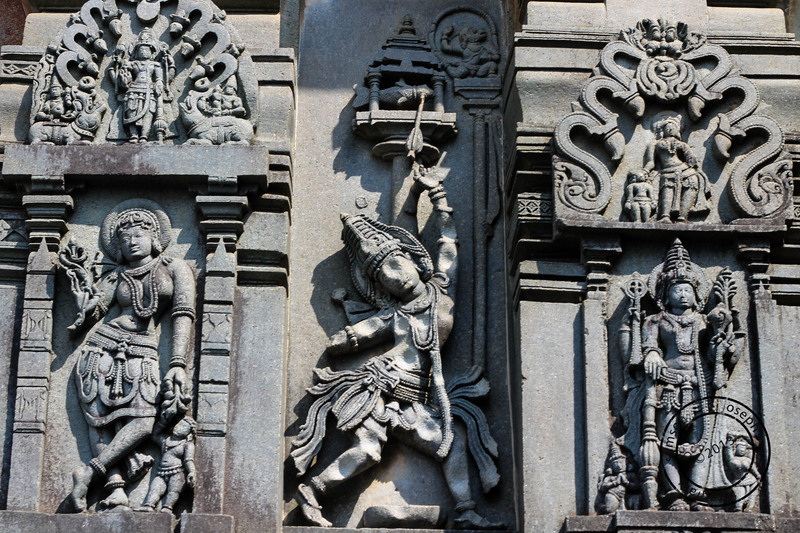 The Chennakeshava Temple of Belur, dedicated to Lord Vishnu, supposedly took 103 years to complete over 3 generations and without doubt is an impeccable masterpiece of a temple. According to inscriptions, the temple was built to commemorate the conversion of King Vishnuvardhana from Jainism to Vaishnavism. The surface of the temple exterior is intricately filled with magnificent carvings, stories from the Puranas, Upanishads and other mythological stories executed in the most authentic way. 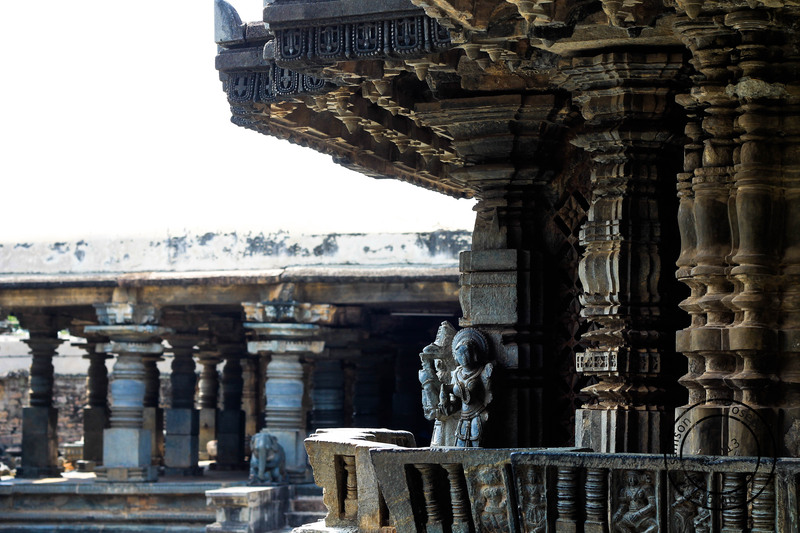 The intricate carvings and sculpture indicate that the Hoysalas loved music and dance and used it to express religion and spirituality. The temple is still in active use and you can actually worship in the temple. Poojas are performed in the morning and evening- a tradition being practiced for over 887 years. The most notable carvings are those of the Madanikas or celestial nymphs. The Madanikas are said to be inspired by the beautiful Queen of King Vishnuvardhana, Shantaladevi, epitomising the ideal feminine form. Each depicts a mood and are carved with clinical precision, making them come alive. Darpana Sundari, or the nymph with a mirror is the most stellar form showcased here. the four friezes or steps of carving that forms the base explains the qualities of a great king, Elephants in the lowest frieze denotes the stability & tremendous strength, above these are the lions that symbolize courage, next are horses showing speed and finally creepers & flowers representing the heart of the king as mild and considerate towards his people. But whats most astonishing is that no two elephants, lions, horses or creepers are similar in carving! There is a very famous usage of the word ‘shilaabaalike’ while describing a beautiful girl in the kannada language. 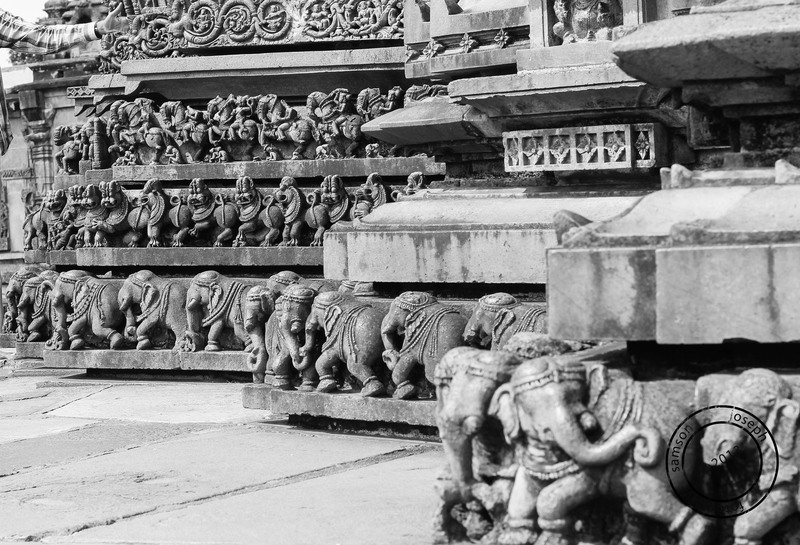 The madanika sculptures of Belur happens to be the source of this term. 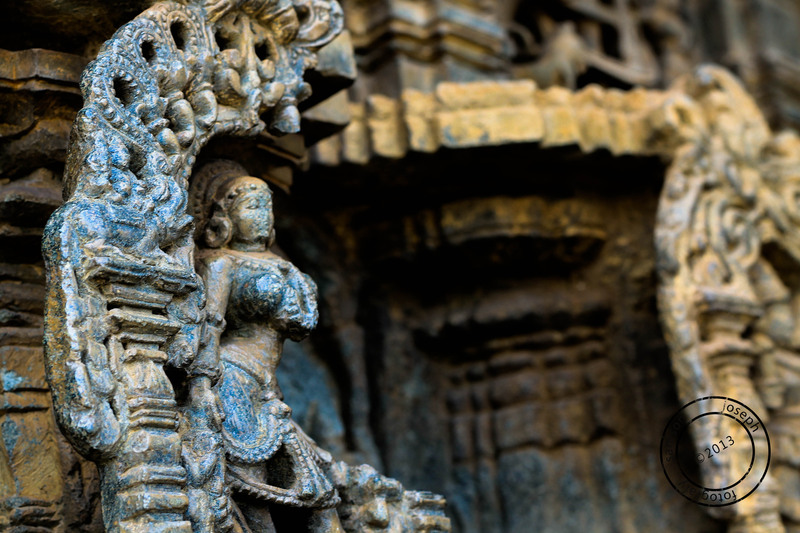 The sculptor brings out the beauty of womanhood through his artwork in stones representing the perfect form of figure, dressing styles and hair-dos in the madanikas of Belur. If the temple’s exteriors are out of this world, it is almost impossible to describe the greatness of its interiors. 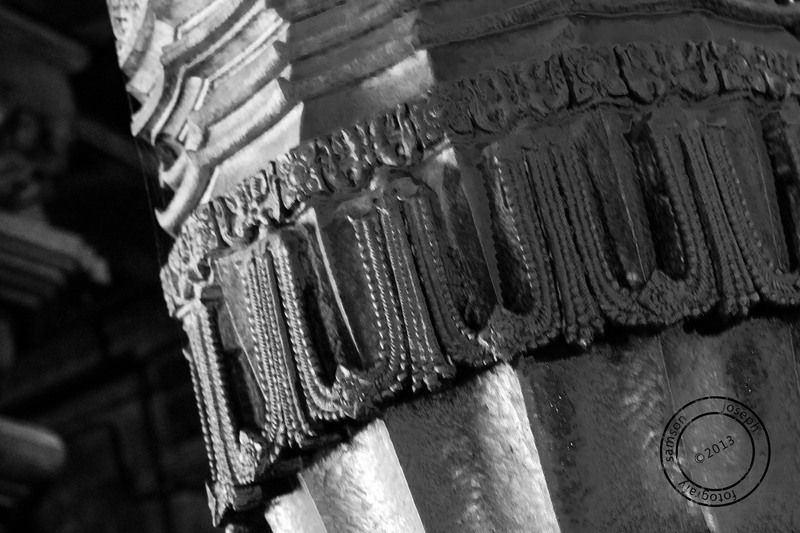 There are about 48 pillars, no two similar, of various sizes, shapes and designs , bearing testimony to remarkable artistry. One of the pillars could revolve on its pivot, like a cabinet. There is another sculpture of a madanika whose stone bangles could be moved along her arms and then there is another pillar on which all the carvings around this temple are carved in miniature forms like an index and there still is a square inch left on it to be sculpted just in case some sculpture was overlooked. The main temple is surrounded by other small ones for Narasimha, Anjaneya and of which the famous being the Kappe Chennigaraya temple. The legend is that, Amarashilpi Jakanachari was sculpting the deity of this shrine and a young man informed him that the stone he was working on was defective. The master sculptor, taken aback, wowed that he would cut his hand if the young man proved it.The young man smeared sandalwood paste all over the image and when it dried, a small portion remained moist at the navel and when that portion was tapped and chiseled, some water, sand and a frog trickled out. It is believed that since then main idol is known as the Kappe (Frog) Chennigaraya. Probably this sculpture is a fine example of how we value our heritage sites. This carving depicting the Draupadi swayamvara from Mahabharatha where Arjuna shoots an arrow at the fish eye supposedly produced musical notes when tapped on it. After years of curious visitors, this is how Arjuna is today. Our guide mentions, the sculptors who carved this marvel hardly left their names on them but the reckless visitors have inscribed most parts with their dirty art! 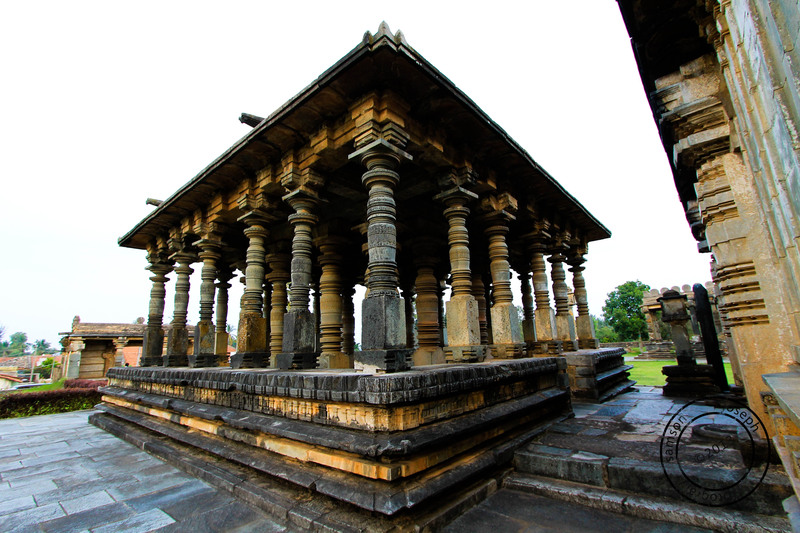 The Hoysalas developed a new style of temple architecture with star-shaped bases. 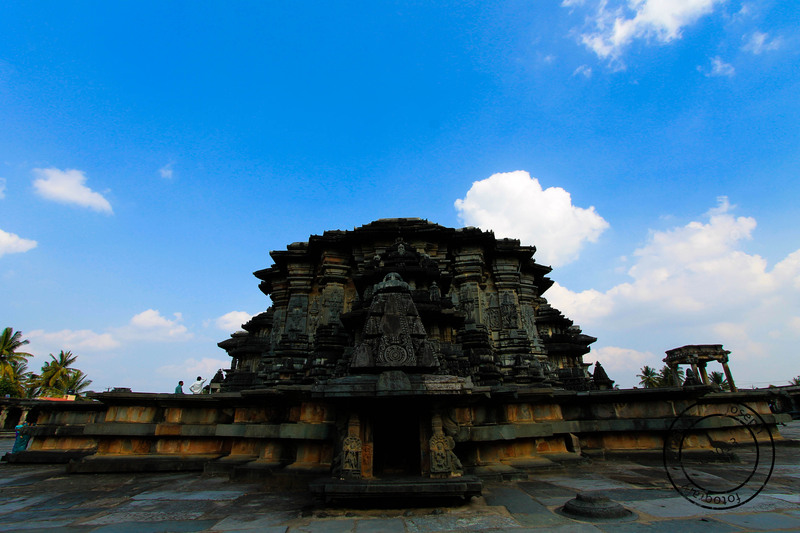 Simply put, if you see a temple with star shaped base then it is a Hoysala Temple from the 10th -14th century. 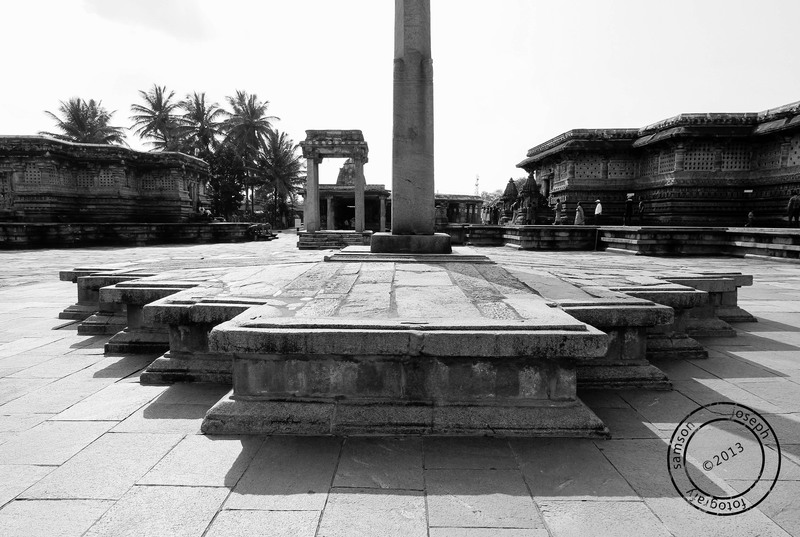 This 42 feet high pillar, known as Deepotsava Stambha, is another show-stealer for it stands on the platform without any support and aptly nick named the gravity pillar. This pillar is standing on three points of its base on its own weight and fourth side has a gap from where a piece of paper can go by. The beautiful ornamental Gopuram of the Channakeshava Temple stands tall , giving a feeling that one is entering a grandiose royal court. 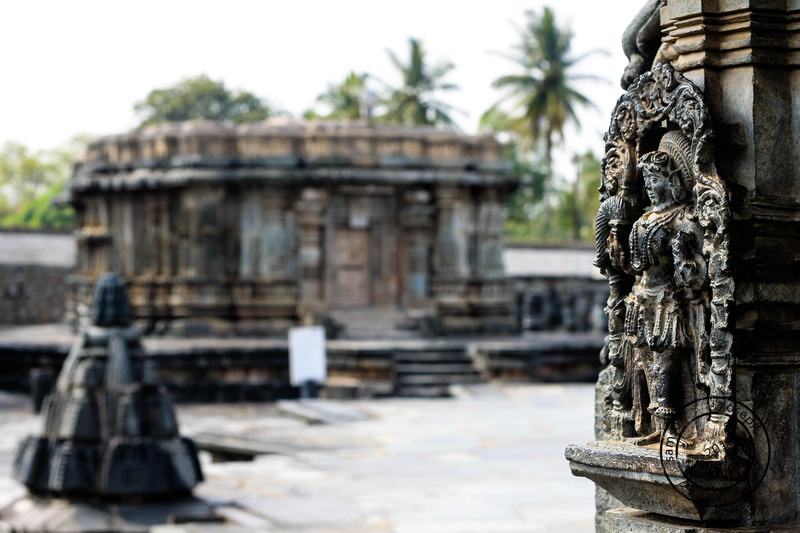 This part of the Belur temple is the most recent as it was constructed later down the years by the Vijayanagara Kings, another prominent dynasty that ruled Karnataka. 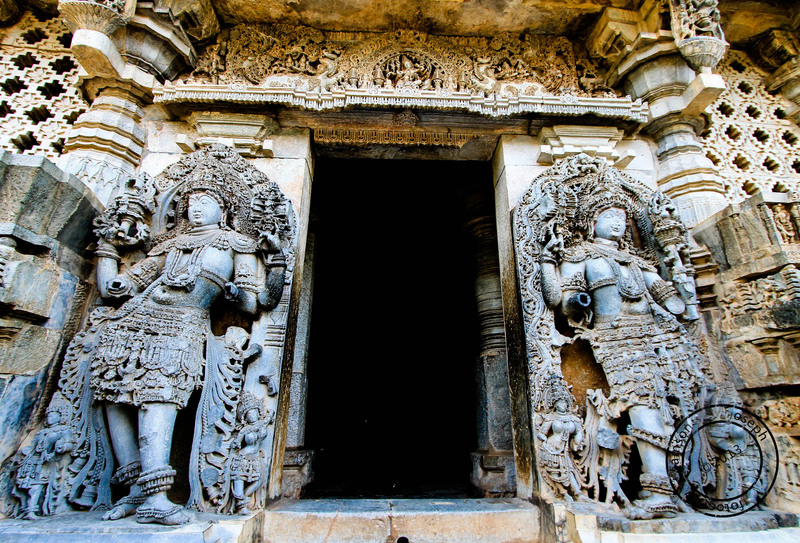 The statues of Jaya-Vijaya, the gatekeepers of Lord Vishnu is a common sight in temples dedicated to Lord Vishnu. But The carvings in Halebeedu is no way closer to any other. 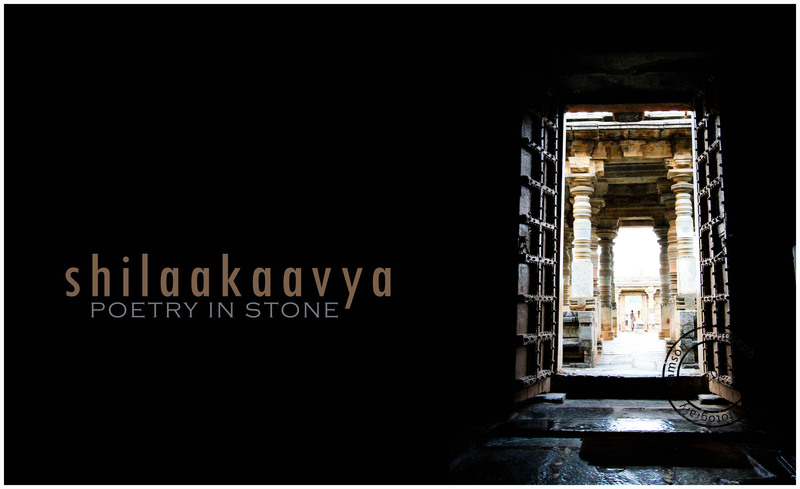 These life-sized stone art structures have some of the finest detailing upto the extent of finger nails! Scholars believe that King Vishnuvardhana was originally a Jain known as Bittideva and under the influence of the Hindu philosopher Ramanujacharya, he converted to Sri Vaishnavism. 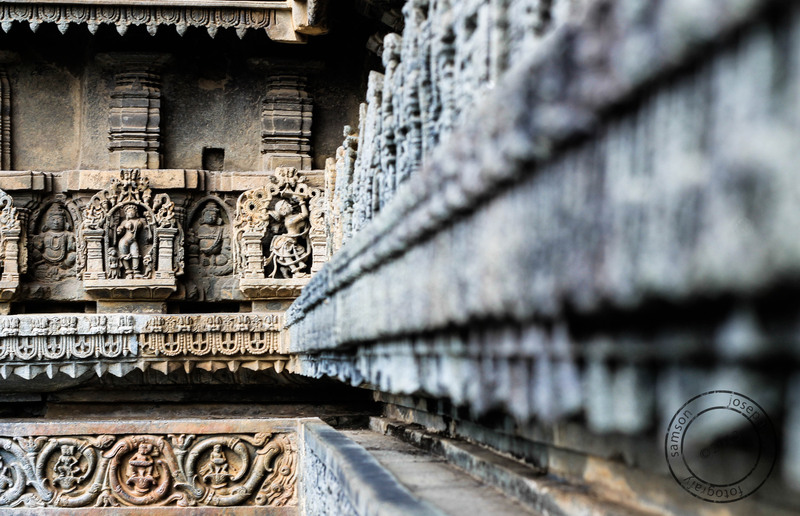 The prominent proofs that stands till date are the two not-so-known jain temples near Halebeedu and yet again these temples, older than the main temples at Belur-Halebeedu, show the Hoysala’s love for architecture and is an architectural delight. Gatekeepers of Lord Vishnu is another picture that I liked, the intricately carved figures are amazing. Thanks, pseudomonaz 🙂 pictures and words fall short to describe these wonders! I hope people respect & admire them forever than destroying! What a beautiful place-hadn’t heard of it!